[31 Jul 2018] Hydro testing KISS tank – E.R.P.S. 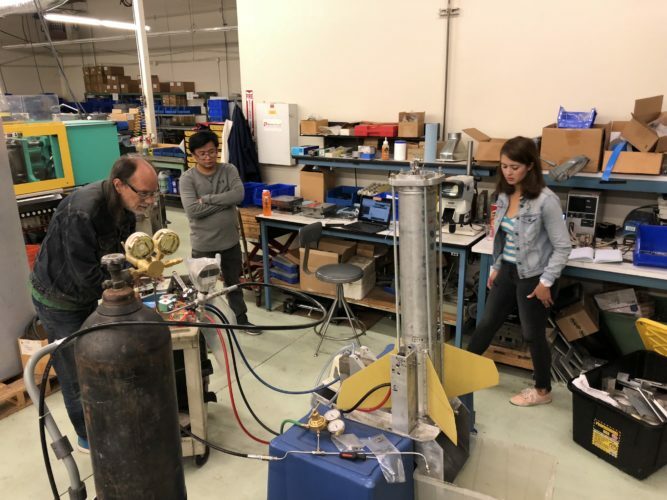 Dave W, Adnan and Dafne work on prepping the KISS tank for a 900+ psi pressure test. 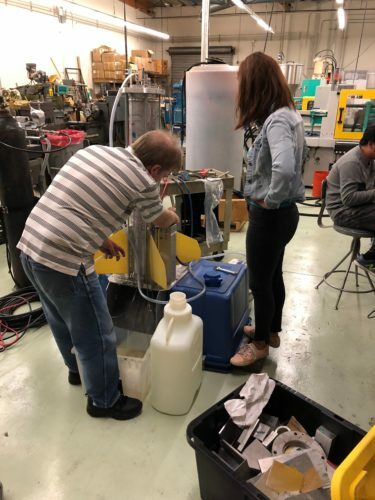 On Tuesday 31 Jul 2018, a group of KISS team members gathered to do a set of hydro tests on the KISS tank. Using the plumbing and pressure system, the Control Panel and pump, DI water was loaded into the tank and it was filled to the brin. The tank was then repeatedly pressurized to 900+ psi and then the N2 gas vented. We video recorded the actuator to see what the response time was like, and it was “pretty fast”. The group feels confident the hardware will work properly for the static test currently planned for 04 Aug 2018 at the F.A.R. site in Mojave. Electronics updates progressed as well, with Adnan working on the DAC update after he and Dafne got a new BeagleBoneBlack chip to replace the one that shorted out. This is a priority item to have ready by the FAR trip Saturday or we may not be able to go. Additional work was planned for 01 Aug 2018. Dan and Dafne load DI water into the KISS tank before the hydro tests. Adnan is working off screen. Meanwhile, Michael worked on the main ERPS web page, adding a post (with pictures and vide) about the 07-08 Jul 2018 static test effort at F.A.R. and converting and posting videos from the earlier KISS flights and static tests to the Video page. Even though folks were there late, a good amount of work got done.